(8) "I Know There's an Answer"
It’s really very like the way classical music works, like a classical opera, say Lakme by [Léo] Delibes (the music that British Airways has appropriated). The melody rises and falls while the echo of that melody, sung by another voice, intertwines with it. Then it goes back to the verse, with its own melody, which is a variation on the chorus melody. As that is sung, the background voices provide an abstract, disconnected harmony. All the time, upfront, is the poetic heart of the lyric. The key gravitates between A major and E major, while the bass-line was written in a different key from the rest of the song. Music theorist Daniel Harrison compared the song to an earlier Brian Wilson composition, "California Girls", as it both avoids a root-position tonic and suppresses a cadential drive. It also contains a step-wise descending bass-line like Wilson's other compositions on the Pet Sounds album. Dominic King believed the barbershop flat seventh saved the song from "excessive sentimentality". The song is told from the point of view of a man or woman contemplating life after death to his/her lover, as Asher describes, "'I'll love you till the sun burns out, then I'm gone,' ergo 'I'm gonna love you forever.'" Wilson explained that "God Only Knows" was "a vision that Tony and I had. It's like being blind but in being blind, you can see more. You close your eyes; you're able to see a place or something that's happening." He initially hated the opening line of the song as "it was too negative." He eventually gave in after hearing the subsequent lyrics. In 1976, Brian said there was no one particular that the song was written for. 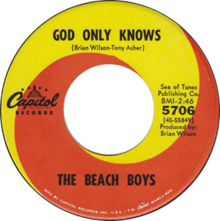 "God Only Knows" is frequently cited for referencing "God" in its title,[nb 1] a decision that Wilson and Asher agonized over, fearing it would not get airplay as a result. As Wilson's then-wife Marilyn describes, "The first time I heard it, Brian played it for me at the piano. And I went, 'Oh my God, he's talking about God in a record.' It was pretty daring to me. And it was another time I thought to myself, 'Oh, boy, he's really taking a chance.' I thought it was almost too religious. Too square. At that time. Yes, it was so great that he would say it and not be intimidated by what anybody else would think of the words or what he meant." Asher explains that he and Brian "had lengthy conversations during the writing of 'God Only Knows', because unless you were Kate Smith and you were singing 'God Bless America', no one thought you could say 'God' in a song. No one had done it, and Brian didn't want to be the first person to try it. He said, 'We'll just never get any air play.' Isn't it amazing that we thought that? But it worked." Wilson added that although he feared putting the word "God" in the title of the song, he eventually agreed to keep it, firstly, "because God was a spiritual word", and secondly, because the Beach Boys would "be breaking ground". Jim DeRogatis states that, as was common in psychedelic rock, the spiritual invocations in "God Only Knows" express non-specific sentiments which could be addressed to any higher force, and that it is "less of a prayer than a sensitive meditation about moving forward in the face of loss". Even though the Wilson family did not grow up in "a particularly religious household", younger brother and bandmate Carl Wilson was described as "the most truly religious person I know" by Brian, and Carl was forthcoming about the group's spiritual beliefs stating: "We believe in God as a kind of universal consciousness. God is love. God is you. God is me. God is everything right here in this room. It's a spiritual concept which inspires a great deal of our music." Gil writes: "It’s a love song, yes, but again, echoing its classical forebears, there is something not quite secular about it. Yes, 'God Only Knows' is a common, casual phrase, but in this context it feels much more literal." According to Brian, many of the musicians who were present at the "God Only Knows" sessions claim that those sessions were some of "the most magical, beautiful musical experiences they've ever heard". He added that there were 23 musicians present during the "God Only Knows" sessions, though only 16 are credited as being present on the actual take that was used for the final song. At the time, 23 musicians was an astounding number of musicians for a pop record. All the musicians played simultaneously, creating "a rich, heavenly blanket of music". A string section was overdubbed thereafter. Sourced from Keith Badman and liner notes included with the 1999 mono/stereo reissue of Pet Sounds, except where otherwise noted. The song first appeared on the Beach Boys' classic 1966 album Pet Sounds in monophonic sound format. Initially, Brian considered releasing it as a single under Carl Wilson's name, but the group were in demand for a new single. Because their impending "Good Vibrations" was not yet ready, "God Only Knows" was issued instead. On July 11, 1966, it was issued as the B-side of the American "Wouldn't It Be Nice" single. In other territories, the song was the A-side. When first released it only reached 39 on the US charts in 1966. Treated as the A-side across Europe, it was a success, peaking at number 2 in the UK, and in national charts cited contemporarily by Billboard: 3 in Ireland, 4 in the Netherlands and Belgium, 6 in Norway, 22 in Germany; and 2 in Australia. In September, the song peaked at 6 in Canada and 24 in France. Mojo magazine ranked the song as the 13th greatest song of all time. In a poll on the MTV station, Vh1, it placed at number 28 on the UK's Nation's Favourite Lyric. It was voted by listeners of BBC Radio 2 as one of the three songs that changes people's lives. In its list of the 100 best singles of the last 50 years, Popdose ranked "God Only Knows" at number 1, saying: "It is simply one of the most beautifully composed and arranged songs in the history of not just pop music, but Western music. To place 'God Only Knows' in its proper context is to compare it not just to 1966 Paul McCartney, but 1836 Frederic Chopin." English broadcaster Dominic King deemed it the most "perfectly constructed song in pop history". Brian's mother, Audree Wilson, believes that "God Only Knows" was one of Brian's finest ever compositions, as she stated in an interview: "'God Only Knows' ... What can you say about it? I still think it's one of his greatest pieces." The song inspired songwriter Margo Guryan to move into writing pop music. She said: "I thought it was just gorgeous. I bought the record and played it a million times, then sat down and wrote 'Think of Rain.' That's really how I started writing that way. I just decided it was better than what was happening in jazz." Bob Stanley of Saint Etienne wrote that "It's impossible to exaggerate how beautiful this song is. Everywhere, it takes risks." Bono said in October 2006 during Brian Wilson's induction into the UK Music Hall of Fame that "the string arrangement on 'God Only Knows' is fact and proof of angels". Jimmy Webb, an American popular music composer, has also stated his love for the song, stating, "I love 'God Only Knows' and its bow to the baroque that goes all the way back to 1740 and Johann Sebastian Bach. It represents the whole tradition of liturgical music that I feel is a spiritual part of Brian's music. And Carl's singing is pretty much at its pinnacle—as good as it ever got." In a 2003 solo concert in Tel Aviv, Steven Wilson, frontman of Porcupine Tree, declared "God Only Knows" as his favorite song of all time. On the Insurgentes listening party that took place in Mexico City in 2009, Steven Wilson said it was a perfect song. Simon Neil of Scottish band Biffy Clyro has the lyrics "God only knows what I'd be without you" tattooed across his chest. 1989: The Wonder Years – used in the episode "Heartbreak"
2016: "The Goldbergs" – used in the third episode of the fourth season "George! George Glass!" 2013: BioShock Infinite – contains a turn-of-the-century barbershop quartet that sings the song while floating past the player on an airship. As the game is set in 1912, the song is used anachronistically, one of many time-bending experiences which characterize the game. Wilson said: "All of the artists did such a beautiful job ... I can’t thank them enough, I'm just honored that 'God Only Knows' was chosen. 'God Only Knows' is a very special song. An extremely spiritual song and one of the best I've ever written." ↑ David Howard called it the first pop single to name "God" in its title. Steven Gaines, Keith Badman, and Tony Asher have said that nobody had named "God" in a pop song's title before. Despite this, Philip Lambert noted that doo-wop combo the Capris had issued a song in 1954 with the title "God Only Knows". ↑ Speculated by Mark Dillon to be Tony Asher. 1 2 3 4 Downes 2014, p. 37. ↑ Beckerman, Jim (March 21, 2015). "'Walk Away Renee' collaborator Michael Brown of Englewood Cliffs, dies at 65". The Record. ↑ Jones 1995, p. 214. ↑ Valentish, Jenny (December 5, 2015). "Pet Sounds acknowledged as a masterpiece, as Brian Wilson brings it to Australia". The Sydney Morning Herald. ↑ DeRogatis 2003, p. 20. ↑ Montes, Kevin (May 16, 2016). "From The Record Crate: The Beach Boys -"Pet Sounds" (1966)". The Young Folks. ↑ Ames Carlin, Peter (September 5, 2008). "That Lucky Old Brian Wilson". Oregon Live. ↑ Hann, Michael (October 8, 2014). "The BBC's God Only Knows cover – every performance reviewed and rated". The Guardian. 1 2 Greene 2010, p. 155. 1 2 "200 Greatest Songs of the 1960s". Pitchfork. Retrieved 2010-07-24. 1 2 3 4 5 6 7 8 9 10 11 12 13 14 15 16 17 18 19 20 21 22 23 24 Dillon 2012. ↑ Lambert 2007, p. 246. 1 2 3 Brennan, Colin; Corcoran, Nina (June 18, 2016). "The Genius of Pet Sounds: Artists Reveal Their Favorite Aspects of The Beach Boys' Classic". Consequence of Sound. 1 2 Lambert 2007, p. 245. ↑ Downes 2014, p. 38. ↑ "Comments by Carl Wilson". The Pet Sounds Sessions (Booklet). The Beach Boys. Capitol Records. 1997. ↑ Harrison 1997, pp. 39, 42. ↑ Lambert 2007, p. 228. 1 2 3 King, Dominic (2005). "Sold on Song Top 100 – God Only Knows". BBC. ↑ Lambert 2007, pp. 227, 245. ↑ Fusilli 2005, p. 102. ↑ Viney, Liam (July 12, 2015). "Love & Mercy: what Brian Wilson's story tells us about genius and music". The Conversation. ↑ Wilson & Greenman 2016. ↑ Leaf, David (1997). The Pet Sounds Sessions (CD Liner). The Beach Boys. Capitol Records. 1 2 3 4 5 Granata 2003. ↑ Fornatale, Pete (November 3, 1976). "Interview with Brian Wilson" (MP3). NY Radio Archive. WNEW-FM 102.7. ↑ Fusilli 2005, p. 101. ↑ Howard 2004, p. 65. ↑ Gaines 1986, p. 147. 1 2 3 4 5 6 7 8 9 10 11 Badman 2004, p. 121. ↑ Lambert 2007, p. 244. ↑ DeRogatis 2003, pp. 20, 35–36. 1 2 3 Doe, Andrew Grayham. "GIGS66". Endless Summer Quarterly. Retrieved October 5, 2014. 1 2 Elliott, Brad (August 31, 1999). "Pet Sounds Track Notes". beachboysfanclub.com. Retrieved March 3, 2009. ↑ Leaf, David (1990). Party/Stack-O-Tracks (CD Liner). The Beach Boys. Capitol Records. ↑ Zak 2001, p. 88. ↑ "Brian behind the BEACH BOYS". Hit Parader: 11. October 4, 1966. ↑ Badman 2004, pp. 121–126. 1 2 3 Pet Sounds (CD Liner). The Beach Boys. Capitol Records. 1999. ↑ Badman 2004, p. 142. ↑ "Pet Sounds Awards". AllMusic. Retrieved 2014-08-21. ↑ "Beach Boys singles". Official Charts Company. Retrieved 2014-08-21. ↑ Badman 2004, p. 145. ↑ Miles 2009, p. 237. ↑ Desowitz, Bill (December 28, 2015). "How They Created Those 'Good Vibrations' for 'Love & Mercy'". IndieWire. ↑ "The Popdose 100: Our Favorite Singles of the Last 50 Years". ↑ Guarisco, D.A. "God Only Knows". AllMusic. Retrieved 2012-02-27. ↑ "An Evening with Brian Wilson". International Committee of the Fourth International. October 24, 2007. ↑ Kent 2009, p. 3. ↑ Broome, Eric (September 2001). "Margo Guryan". Mean Street magazine. Retrieved 26 July 2013. ↑ Stanley 2013, p. 220. ↑ ""Weird Rock": A Conversation with Simon Neil and Ben and James Johnston of Biffy Clyro". Pop Zap. Retrieved 2011-06-28. ↑ Erlewine, Stephen Thomas. "David Bowie – Tonight". AllMusic. Retrieved 28 December 2015. ↑ "Rhino Revisits Costello's 'Juliet Letters'". Billboard. 2006-02-03. Retrieved 2016-03-15. ↑ Fear, David (September 13, 2014). "Heroes and Villains: 'Love & Mercys Paul Dano on Playing Brian Wilson". Rolling Stone. Retrieved September 13, 2014. 1 2 "God only knows how the BBC made this video". Telegraph.co.uk. 9 October 2014. ↑ "BBC Music's God Only Knows in aid of BBC Children in Need". BBC. October 7, 2014. ↑ "BBC unveil all-star version of God Only Knows, 17 years after Perfect Day". The Guardian. October 7, 2014. ↑ "God Only Knows BBC music video: Like a propaganda film made by a dictatorship losing its credibility". The Independent. October 8, 2014. ↑ "God Only Knows: not quite a perfect day as BBC sings its own praises". The Guardian. October 7, 2014. ↑ "Launches with God Only Knows, a star-studded film featuring 'The Impossible Orchestra'". BBC Music. October 7, 2014. ↑ "BBC Music – BBC Music – Who's in the Impossible Orchestra?". BBC. 7 October 2014. ↑ "Chart Track: Week 42, 2014". Irish Singles Chart. ↑ "Various – God Only Knows Media Forest". Israeli Airplay Chart. Media Forest. Retrieved October 23rd, 2014. ↑ "Archive Chart: 2014-10-18". Scottish Singles Top 40. Retrieved 12 October 2014. ↑ "Archive Chart: 2014-10-18" UK Singles Chart. Retrieved 12 October 2014.